Ultimately, we want to prioritize the client if we can’t service them, we’d love to get them connected with somebody who can. 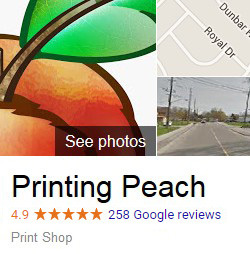 Because we don’t service clients outside of Canada, we’re putting together a list of a few printing companies we’ve connected with outside of Canada. Brochure Printing in the UK (TradePrint.com) Rubbed shoulders with these guys online… Seem like nice fellows! Give them a call if you are in the UK and need some printing (or are going to be in the UK). Nova Disc (CD & DVD Manufacturing) With facilities located all across the nation, Nova Disc delivers reliable and expedient turnaround times, coupled with superior quality product. AFD Design & Print AFP Design and Print use various printing processes to provide a one-stop printing service to customers throughout the UK, from full colour business cards printing to full colour letterhead printing, as well as full colour leaflets and hot foil printing. Print Clever We manage your print production process from start to end, taking the hassle from you and assuring you a quality end result and competitive price through our many preferred suppliers. .
www.marchhousebooks.co.uk Your online source for rare and out of print books, especially children’s and illustrated. These guys are great, if you’re looking for that ‘book from your childhood’ that you just have not been able to find anywhere. www.crookedbrook.com. Crooked Brook is a label used by the atelier division of our art studio. The atelier is a full-service embroidery, apparel design, pattern making, sample making, and small lot production shop. www.gingertheartofprint.co.uk – Giclée printng offers many benefits to artists and publishers allowing an edition of work to be printed on demand. Giclée prints are recorded and stored as digital files and can be reproduced as and when required – allowing artists, photographers and illustrators to print any quantity from one offs to your edition limit. www.selfpublish.com.au – Self Publish Australia provides book publishing, book printing services and self publishing support for independent authors & business at economical prices – small or large print runs of paperback books, hardcover casebound, childrens books, photobook coffee table publications and beautiful cook books. We supply book printing for Melbourne, Sydney, Brisbane, Adelaide in fact we deliver to your door, anywhere in Australia from our Perth premises. www.fontainepress.com – Fontaine Press supplies Australia with quality economical specialist custom book printing. Our client list includes publishers, independent authors, small to large business, government departments and non-profit organisations. Submit your details, and a friendly Fontaine Press publishing assistant will be in touch with competitive pricing options to make your next book printing project a viable, profitable reality. …We promise to add more!